↑ ক খ Shaw, Ian, ed. (2000). 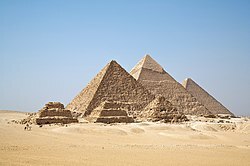 The Oxford History of Ancient Egypt. Oxford University Press. p. 479. ISBN 0-19-815034-2. ↑ Carl Roebuck, The World of Ancient Times, Simon & Schuster, 1984. ISBN 978-0684137261 পৃঃ - ৫৬।. ↑ Bard, Kathryn (1999). Encyclopedia of the Archaeology of Ancient Egypt. Routledge. pp. 85–87. ISBN 0-415-18589-0. ↑ Toby A. H. Wilkinson: Early Dynastic Egypt, New York 1999, S. 60–61. ↑ Michel Baud: The Old Kingdom. in: Allan S. Lloyd (Hrsg. ): A Companion to Ancient Egypt, Blackwell Publishing, Malden und Oxford 2010, ISBN 9781405155984, S. 59–65. ↑ Stephan J. Seidlmayer: The Relative Chronology of dynasty 3. in: Erik Hornung, Rolf Krauss und David A. Warburton (Hrsg. ): Ancient Egyptian Chronology, Leiden 2006, S. 116–123. ↑ Rainer Stadelmann: Fourth Dynasty. in: Donald B. Redford (Hrsg. 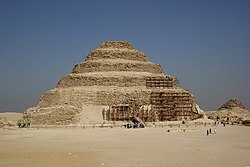 ): The Oxford Encyclopaedia of Ancient Egypt, Oxford University Press, Oxford und New York 2001, ISBN 0195102347, S. 593–597. ↑ Michel Baud: The Old Kingdom. in: Allan S. Lloyd (Hrsg. ): A Companion to Ancient Egypt, Blackwell Publishing, Malden und Oxford 2010, ISBN 9781405155984, S. 73–74.